A primary objective of this investigation is to tell the story of the compelling role Chicago’s West Side played in the making of modern America in the late nineteenth and early twentieth centuries, an era publicized to the world by Jane Addams and the Hull-House Settlement on Halsted Street. 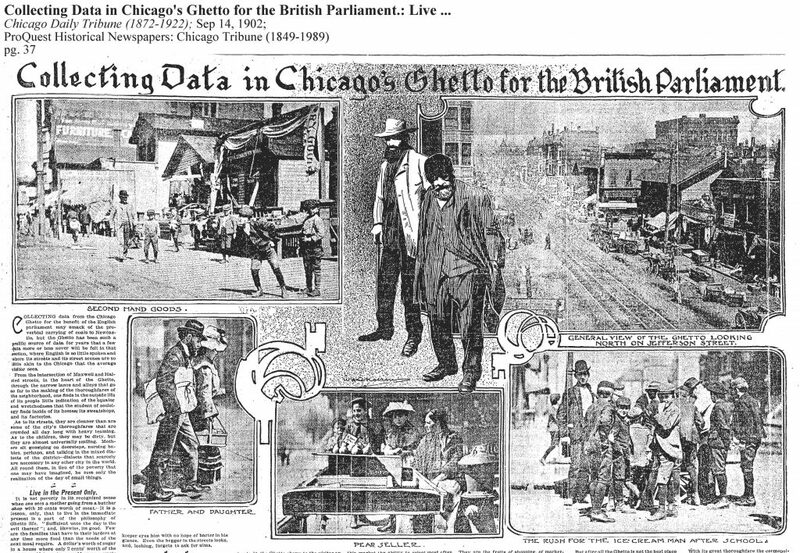 Chicago’s West Side was a microcosm of the explosive diversity of a foreign immigrant, domestic migrant, industrial, consumer nation. Global in reach and portal to world populations in transit, the densely populated inner-city business and working class residential streets housed “alien” nationals, “race” colonies, and native “white” Anglos–speaking thirty languages on the polyglot West Side streets. A destination for prominent global tourists. First city streets surveyed for nationality and wage (color-coded) mapping by Settlement house social workers. Site for pioneering medical research at schools and hospitals in the West Side medical center. An experimental street laboratory for the first school of urban sociology at the University of Chicago. This historic event–a turning point in the personal histories of hundreds of thousands of different peoples with diverse lives moving in and through the dense urban working class area on Chicago’s West Side–merits our thoughtful attention in current times. A secondary objective of the investigation is to make accessible to the public an expansive array of original sources, written and visual. By means of exploring multi-disciplinary and multidimensional types of evidence, the project constructs life-size topics of timely interest to working individuals, families, and groups. This was the first historical period when the affordable street camera came to the consumer market. A “photo story” emerges picturing everyday lives within historical narrative contexts. Visual cultures in authentic settings are integrated with historical witnesses. What it looked like in a photograph in contrast to a graphic illustration made a difference to understanding. “Ever the human documents.” In the realm of historical time, place mattered, consequences were real, and life’s milestones from birth to death meaningful. The passage of human time is relentless, irreversible, and finite, everywhere for everyone. In “human documents” the unique past is valued, and resemblance to more recent historical trends raised to awareness. Understanding an historical event in this project is realized by experiencing aspects of the lives of those struggling to find meaning in a place. They often had to challenge generations of tradition and customary belief including habits of provincial prejudice. The powers of established orthodoxies within national, religious, ethnic, race and gender identities were prevalent, often overpowering. Tensions between change and convention are an enduring feature of the story. The historian’s universe neither privileges subjective fictions of myth and imaginative story telling nor objective sciences of measurement and numbers. No single piece or genre of documentation is definitive, or credible at mere face value. In the Vicinity of Maxwell and Halsted Streets, Chicago 1890-1930 constructs an intimate fresh urban perspective on years labeled a Progressive liberal era in U.S. history. As ever in the “human documentary,” the historical devil embedded in the riches of archival sources dwells in the local detail.